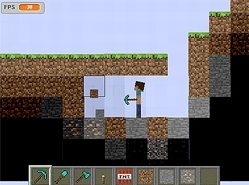 In the Minecraft world, each player has surely known that making a Minecraft cake is not difficult, but it takes much time to learn about its recipe and look for suitable ingredients. Today, coming to Minecraft Cake Ingredients, they will feel excited to experience a process of making this item. Try it now! First of all, mine rocks on the interface to earn points. Why? The points will help disclose right ingredients hidden behind the square at the top. Once there are 100, the complete Minecraft cake will be created successfully. As seeing, the rocks are divided into 2 kinds: Blue and Normal; hitting the Blue one will bring back 5 points, and the Normal one is only for one point. Therefore, it's better to get more rocks via the white bar at the bottom for wise hits. Minecraft Cake Ingredients is good for all Minecraft fans wanting to learn how to make the Minecraft cake. Relish it now! Instructions: Minecraft Cake Ingredients is managed by controlling the left mouse.